We’re being bombarded daily by prognostications of retail doom and the imminent death of bricks and mortar retailing. 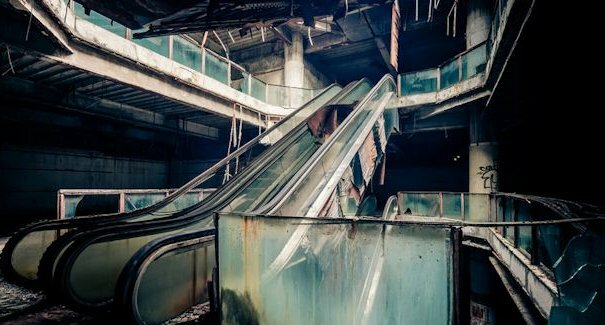 If one is to believe the pundits, in the near future shopping strips and regional malls will be abandoned decaying structures, reminiscent of Alcatraz. Admittedly, the advent of digital and 24/7 pervasive ecommerce has enabled a seismic shift in consumer shopping habits. It’s important to note that digital didn’t create the desire for “always on” shopping, it simply enabled it. Retailers that complain of being marginalized in an ever increasing digital commerce environment simply need to ask themselves, “Why is this happening?” Ask yourself: Is your current format the most efficient way for consumers to explore, learn and buy your products? Do you engage, excite and educate shoppers when they invest their precious time in your stores? How are you exceeding their expectations? Are you saving them time, creating value or offering emotional reward in their shopping journeys? If you aren’t doing these things, it’s not your competitors or Amazon’s that is killing you – it’s your lack of customer-centric focus! Customer centricity has become an over-used catch phrase, and the problem with such catch phrases is that once we know its meaning, we usually stop asking the deeper questions. Rather than actively study the complexity and concepts that underlie the “shorthand”, we profess the phrase and assume others will know the specifics. Clienteling, CRM and Loyalty are some of the worst offenders. Simply put, customer centricity means that your organization’s physical environment, culture, staffing, technology, assortment and financial decisions are all made from the perspective of the customer. It requires taking absolute responsibility for the customer’s satisfaction through every possible step of their preferred shopping journey. It means solving their “problem” on their “terms”. To more fully understand the future of retail and the increasing role of digital we need to do a better job defining what is meant by “RETAIL”. Merriam Webster defines it as “to sell in small quantities directly to the ultimate consumer.” The definition implicitly contrasts retail to wholesale but tells us nothing of how consumers interact with sellers to conduct commerce. Clearly, the anticipated demise of retail is not referring to the end of commerce, but instead it refers to a transformation of how and where commerce is conducted. Clearly, the anticipated demise of retail is not referring to the end of commerce, but instead it refers to a transformation of how and where commerce is conducted. Unfortunately, we lack the precise lexicon to accurately describe retail in all its various forms. The way consumers engage with their grocer is unlike how they purchase a new outfit, or engagement ring, or laptop or new kitchen. While all of these transactions are technically “RETAIL”, the path to purchase, underlying consumer behavior and level of engagement differs greatly. Those retailers that succeed in the years ahead will digitally transform their businesses to address the changing behaviors of their increasingly demanding customers. While the pace of change may be accelerating, retailer have always adapted to the influences of new technology and resulting social change. Since the 12th-century merchants have sold curated products at organized markets or bazaars, using many of the same basic retailing principals we see today. The proverbial market square then, like the high streets and regional malls of the recent past, have always been an important aspect of daily life — further enhanced by an environment that creates connection with the community. Then like now, curation, connection and commerce were fundamental elements of a positive retail experience. What has changed over the centuries is the efficiency, transparency and scalability of the underlying “selling platform” that supports these three elements of the retail process. Then like now, curation , connection and commerce were fundamental elements of a positive retail experience. What has changed over the centuries is the efficiency, transparency and scalability of the underlying “selling platform” that supports these three elements of the retail process. In the past, merchants and traders conveniently assembled in town squares and along high streets, adhering to quality standards and transacting on a uniform currency. As new technologies like automobiles and the influence of media reshaped societies, that retail platform was usurped. Starting as early as the late 1950’s large regional suburban malls and shopping centers reinvented retail, offering improved experiences. With hundreds of stores, these shopping centers resulted in more relevant curation and selection, fostered social connection (restaurants, amusements, and theatres) and took advantage of efficient infrastructure to enable commerce (POS, payment, merchandising systems, ERP, etc.). In towns across America, high street shopping virtually disappeared and thousands of previously vibrant retailers shuttered their stores. Retail didn’t die, it simply evolved to meet the changing needs, tastes and lifestyles of its customers. For those multigenerational neighborhood retailers it felt like a “retail apocalypse”, but it was just retail adapting to the market and technological capabilities of the day. Similarly, the normative shift that retail is undergoing today is the result of new technologies transforming the curation, connection and commerce equation. Online search, marketplaces, curation apps, location-based marketing and subscription retailing are the digital equivalent of a village markets and regional malls. Digital is transforming the social connection element as well, especially for younger shoppers. Digital natives experience their physical and digital lives simultaneously, creating real-time human connection and “shop-alongs” with their friends. These shopping journeys are aided by chat, digital cameras and myriad social platforms. For these digitally savvy consumers, omni-channel is assumed and flowing in and out of the online and physical experience must be frictionless, transparent and fun. Conventional retail selling platforms (stores) are capital and real-estate intensive and lack the agility to address dynamic changes in market demand. Double digit decreases in customer traffic and a shift toward digital commerce has many retailers closing stores and reducing staff. This might be a prudent response if one sees the growth of digital simply as a shift from one retail selling platform to another. An argument can be made that for many categories (i.e. consumables and other regularly purchased products), disruption will be swift as IoT platforms like Amazon’s Alexa, Samsung’s Smart Refrigerator and HP’s Instant Ink will address the consumers need for convenience. However, for many more retail categories, blending digital consumer engagement with the physical store will best address the evolving needs and desires of their customers. A recent study by Sapient Razorfish concluded that while most consumers start their hunt outside the walls of the store, between 53-67% of consumers preferred shopping in physical stores. A recent study by Sapient Razorfish concluded that while most consumers start their hunt outside the walls of the store, between 53-67% (age-based) of consumers preferred shopping in physical stores. This is particularly true when retailers invest in clienteling tools for their associates and focus on personalization, demonstrations, in-store events, and concierge level services. 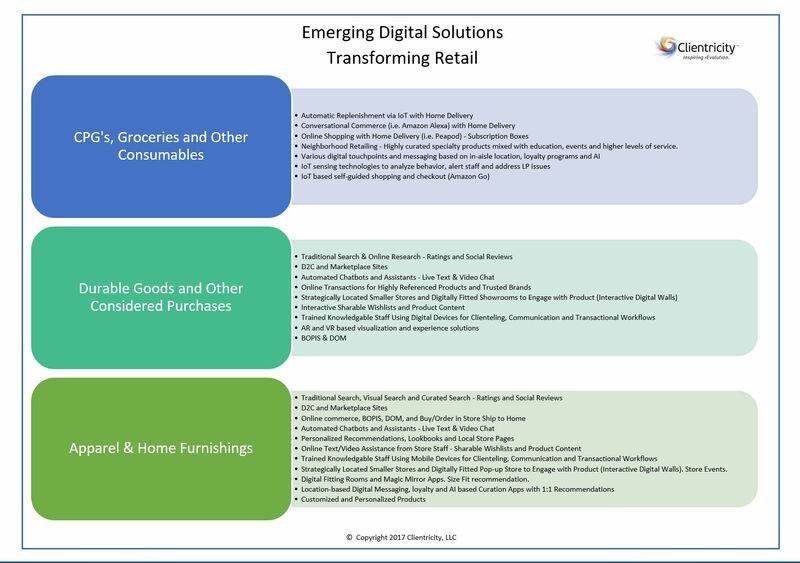 Let’s examine just a few different types of shopping categories to see how each will be supported by emerging digital and physical store practices and technologies. Surviving in an era of technological change requires that the entire retail landscape be reimagined. Fortunately, retail has historically excelled at creatively adapting to changing tastes, behavior and economic conditions. Today’s retail leaders are redefining malls, stores, business models, experiences and organizational structures to exploit new digital opportunities and exciting new ways so they can engage the customer before, during and after the sale. There will undoubtedly be retail winners and losers in the months and years ahead, but those that survive will ultimately thrive by building innovative business models that meet the customer-centric demands of a digitally enabled in-store experience.